For the second year AMRHA has held the Western National Championships and already its starting to break records and set milestones. 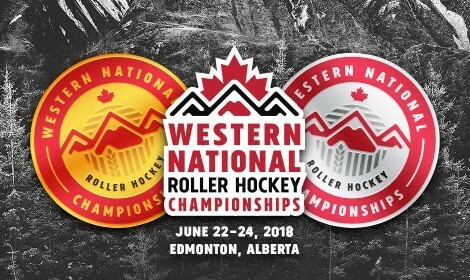 With 52 teams participating shattered the previous record for teams participating in a provincial roller hockey contest. There were over 500 hockey players from 3 provinces that participated in the weekend. Another first - AMRHA brought in officials from outside the province to come work a tournament. In a reciprocal agreement with BC roller hockey we were able to bring in some new officials for just the Western Nationals. AMRHA is hoping this will be the start a truly pan Western collaboration. The tournament also featured the 2018 championship playoffs for the new AB Pro Roller Hockey League, with the championship game going to Overtime. The big trophy went to the Sherwood Park Archers over the Red Deer Reign. It was an end to end edge of your seat final that saw over 150 fans glued to their seats. So many firsts for such a great tournament. This can only mean 2019 will be our best year yet! In addition to the 125 hockey games there was also a lot of extras for the participants and spectators. The Team AB fundraisers, prize raffle, 50/50 and pancake breakfast as well as the skills competition and the kids carnival for the younger siblings. There was tons of excitement and fun at the East Soccer Centre and Ardrosson Saturday and Sunday. The tournament started on Friday at 7:00pm and ran on 6 surfaces till 5:00 pm on Sunday. The games were played at the East Soccer Centre in Edmonton and the Ardrosson Recreational Complex. Two great facilities within a 15-minute drive time between them. There were teams from a dozen municipalities and a few teams made up from players from across Western Canada. No one who wanted to be a part of the event was left sitting on the sidelines. The weekend was packed with end to end great hockey!